Manchester United ran out 3-1 winners at the Emirates Stadium on Saturday to record our eighth victory at Arsenal in the Premier League era. As a result we are now seven points ahead of the Gunners after 15 games and maintain second place after Chelsea had drawn level on points earlier in the day with a 3-1 victory at home to Newcastle United. Antonio Valencia opened the scoring after only four minutes when our captain intercepted a loose cross-field pass from Laurent Koscielny before playing a one-two with Paul Pogba and coolly sliding the ball under Petr Cech in the Arsenal goal. Not longer after and Jesse Lingard made it 2-0 when Romelu Lukaku picked off Shkodran Mustafi’s careless, playing the ball into Anthony Martial whose excellent first touch gave Jesse Lingard a one-on-one with the Arsenal goalkeeper inside the penalty area. The England international finished first time in off the post. Though Alexandre Lacazette did pull one back for the Gunners inside the first four minutes of the second half, Lingard scored his second just after the hour following an excellent assist from Paul Pogba. The French star was later sent off for a stamp on Hector Bellerin but we held on for the 3-1 victory. 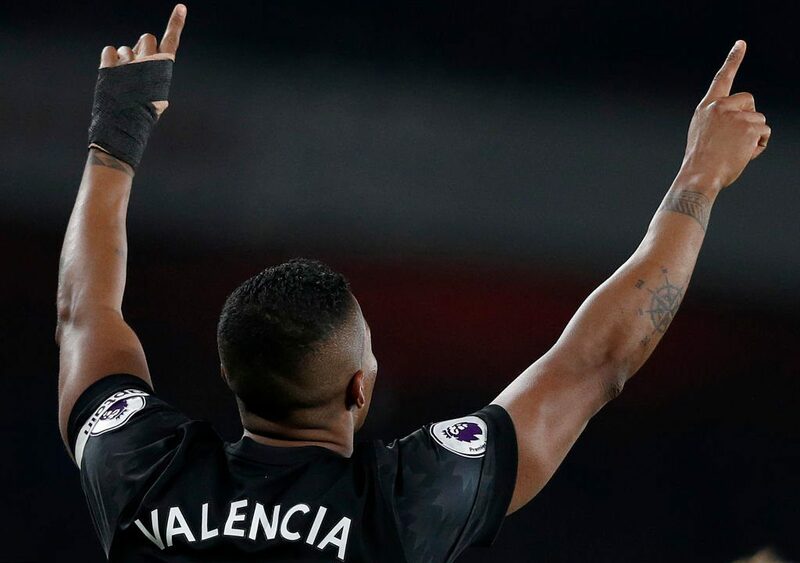 This means that Antonio Valencia has now scored in 22 different Premier League matches and incredibly he has won 21 of those. The one exception was a 2-2 draw for us at West Ham in April 2013. Valencia’s first Premier League goal came for Wigan Athletic in a 4-0 thrashing of Manchester City in October 2006. His full goalscoring record can be seen here.